Air Barriers and Vapor Retarders: The Current Conundrum in the Roofing Industry | Academy Roofing | Commercial and Residential roofing contractor and repair company in Atlanta. The roofing industry continues to discuss vapor retarders but should be discussing air barriers. One of the primary purposes of a building envelope is to keep moisture out of a building. What makes this difficult is that water comes in many forms and can take many paths into a building. Therefore, building designers need to account for bulk water, capillary water, air-transported moisture, and water vapor, and deal with each of these with different forms of defense. Bulk water (i.e., rain and snow) is kept out of buildings with roof membranes and facades of all types. Capillary water is primarily a ground-based issue involving water moving into and through the building envelope via capillary action. Foundation waterproofing and water barrier layers or components are used to prevent this intrusion. Air-transported water, as the name implies, is carried into a building by air that infiltrates the building envelope. 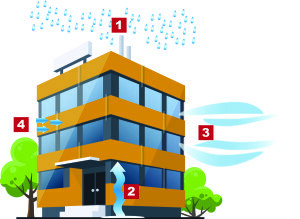 Water vapor enters a building by the process of diffusion of water through the building envelope materials. There is an order of priority for the prevention of water intrusion. Bulk water is most critical, capillary water is second, then air-transported water, and finally, of least concern—although still important—is vapor diffusion. The design, manufacturing, and construction industries are quite good at keeping bulk water out of buildings. They are also quite good at keeping capillary water out of buildings. They have only recently begun to focus on the importance of keeping air out of buildings. That is why the International Energy Conservation Code (IECC), since 2012, requires all new buildings to include an air barrier. The main reason for air barriers is to keep conditioned air from escaping and exterior air from infiltrating, but air-leakage prevention in building envelope keeps the moisture in the air from passing into and out of buildings. It may be a secondary reason, but nonetheless, this reason is important! You may be wondering why air-transported water is a bigger issue than vapor diffusion. Indeed, the roofing industry has discussed vapor retarders for decades, but only recently focused on air barriers. But “back in the day,” multi-ply asphalt-based vapor retarders that were installed above the roof deck and below the insulation were also acting as very effective air barriers. Let’s compare vapor diffusion and air-leakage from the perspective of how much water is transported for each process. Lstiburek1, et al, determined that—in a warm climate—approximately 1½ pints of water will diffuse through a 4’x8’ gypsum board, and approximately 14 pints of moisture will be transported by air passing through a 1”x1” hole in that same gypsum board. The same research showed that—in a cold climate—approximately 2/3 of a pint of water will diffuse through a 4’x8’ gypsum board, and approximately 60 pints of water will be transported by air passing through a 1”x1” hole in the same gypsum board. 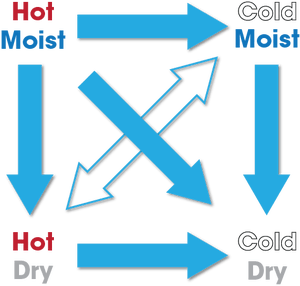 Another way of stating this is: In a warm climate, air transports 10x more water than diffusion, and in a cold climate, air transports 100x more water than diffusion. This is why air-transported moisture is much more critical to prevent than water vapor that enters a building by diffusion. It has been suggested that air infiltration and exfiltration make up 25 to 40 percent of the total heat loss in a building in a cold climate and 10 to 15 percent of total heat gain in a hot climate.2 This is likely why the IECC have air-barrier requirements and do not have any significant vapor retarder requirements for building envelopes. Heat, moisture, and pressure always equalize when possible (i.e. if paths are available to do so). That’s why there is a drive for warm, moist air to leave a building during winter when it’s cold and dry outside. Membrane billowing occurs when wind creates a negative pressure above a roof system and lifts the membrane between the rows of fasteners in the seams. A billowing membrane brings interior air into the roof system regardless of temperature or moisture levels. Air conditioning and heating equipment force air through ductwork and into the interior of a building. By forcing conditioned air into a space, the space can become somewhat pressurized. Not to a great extent, but enough to create an imbalance between the interior and the exterior, forcing interior air into the roof system. A less desirable scenario for air and moisture infiltration into a properly installed roof assembly is to use a mechanically attached (MA) system with a single layer of insulation without a vapor retarder/air barrier (VR/AB). The MA system billows; the lack of VR/AB allows warm moist air to enter the roof system; and the board joints allow a direct path for air flow from the deck to the membrane. 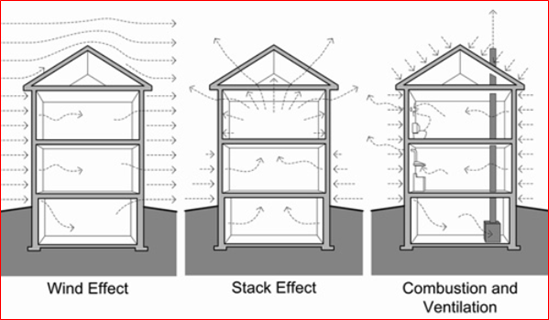 Figure 4: A less desirable roof-design scenario for air and moisture infiltration into a roof assembly. Figure 5: A roof design that improves longevity and thermal performance. Vapor retarders do just as they are named—they reduce vapor diffusion, but not all vapor retarders are equal. There are 3 classes of vapor retarder materials, as shown in the figure. The lower the perm rating, the less diffusion occurs through a material. Most roof membranes are Class I vapor retarders. A single layer self-adhered, bituminous vapor retarder has a perm rating of 0.03 perms. Plywood (1/4” thick, Douglas fir, exterior glue) is a Class II vapor retarder with a perm rating of 0.7 perms. The same plywood with interior glue is a Class III vapor retarder with a perm rating of 1.9 perms. 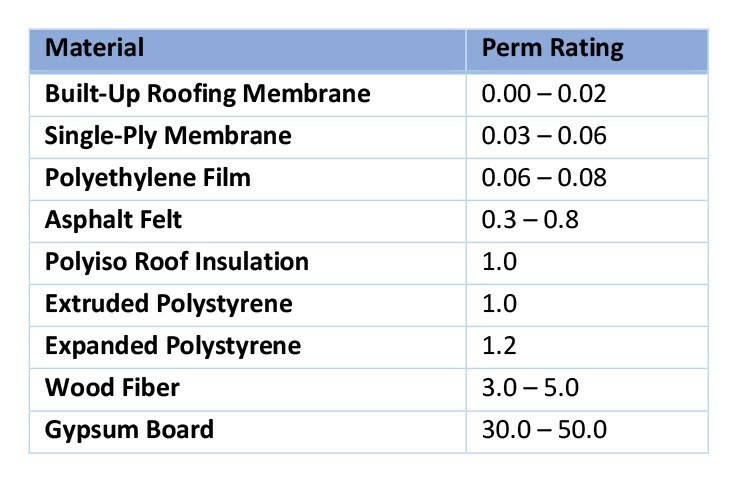 Perm ratings for additional roofing materials are shown in the figure. Remember, these are material ratings; the full system needs to be designed and installed correctly for proper functionality. From a designer’s perspective, if a vapor retarder is needed, which class should be used? If a Class I vapor retarder is used, the concern is that any moisture (e.g., construction moisture due to installation methods, weather, etc.) that enters a roof system won’t be able to dry out. It’s often a good idea to select a vapor retarder that will allow some amount of drying from diffusion. Exceptions to this idea include roofs over indoor swimming pools and other high-humidity producing activities or processes. Another exception is a Class I vapor retarder should be installed over a new concrete deck to prevent the moisture in the concrete from drying into the roof system. Here’s a key takeaway—all vapor retarders block air, but not all air barriers block vapor diffusion. That means that when we use a vapor retarder in a roof system, it’s also acting as an air barrier. The caveat is that the vapor retarder needs to be sealed at all perimeters and penetrations, and tied to the wall air barrier so air does not bypass the vapor retarder layer. So, practically speaking, all vapor retarders are air barriers if they are installed to block the passage of air. The traditional way of designing roofs with vapor retarders is to install an asphaltic vapor retarder (a single layer modified sheet or a double mopping of asphalt) either directly to the deck or over a fastened hardboard. What if that hardboard or plywood deck was recognized to be the air barrier layer, but had a moderate or high perm rating? Since air movement brings 10-100 times more moisture as compared to diffusion, perhaps we should be considering the use of Class II or III vapor retarder (e.g., hardboard or plywood deck) installed to be an effective air barrier that also allows some drying potential? The wall industry has been doing this for quite some time. Should our roof systems be designed similarly? A gypsum-fiber board has a perm rating of approximately 24 to 30 perms, depending on thickness. If this board is fastened to a steel deck and the joints and transitions are taped, it could be an effective air barrier that allows some drying. Something for roof designers to consider! Roof system design is always the responsibility of the designer, but perhaps the designers in the roofing industry can find some takeaways from the wall industry. There is always more to learn and understand about the building science of our roof systems. James R. Kirby, AIA, is GAF’s building and roofing science architect for the East Coast. Jim has a Masters of Architectural Structures and is a licensed architect. He has nearly 25 years of experience in the roofing industry covering low-slope roof systems, steep-slope roof systems, metal panel roof systems, spray polyurethane foam roof systems, vegetative roof coverings, and rooftop photovoltaics. He understands the effects of heat, air, and moisture movement through a roof system. Jim presents building and roofing science information to architects, consultants and building owners, and writes articles and blogs for building owners and facility managers, and the roofing industry. Kirby is a member of AIA, ASTM, ICC, MRCA, NRCA, RCI, and the USGBC. Instagram Feed – Follow Us! Academy Roofing is a leader in the Atlanta roofing industry. From residential to commercial roofing and gutters, we've got you covered. We service the Greater Atlanta area and beyond from our Kennesaw / Marietta, GA Headquarters.